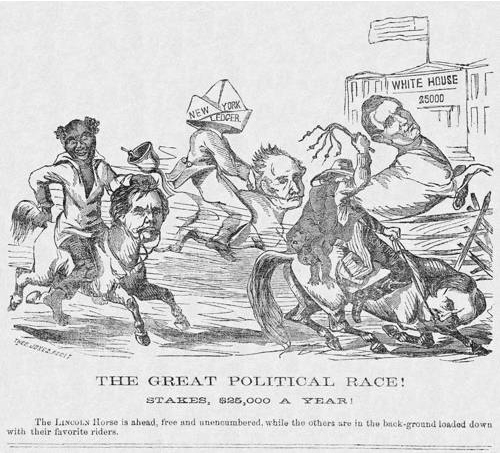 Description: This Cincinnati Rail Splitter uses the common horserace metaphor for the 1860 presidential election. It presents the “free and unencumbered” horse of Republican Abraham Lincoln leaping the fence easily on its way to the prize of the White House and the $25,000 presidential salary. The other three candidate-horses carry heavy burdens that will prevent their success in the race. Southern Democrat John Breckinridge is saddled with the cruel “Slave Trade.” Constitutional Unionist John Bell is ridden by editor Robert Bonner, whose New York Ledger paper hat obscures his vision. Northern Democrat Stephen Douglas carries the weight of Dred Scott, the Supreme Court ruling that undermined his advocated policy of letting the territorial voters decide the legality of slavery (“popular sovereignty”).